Prior to starting university, Daniel was working full time as a sports development worker. Although he'd always wanted to go to university, he had no idea what the application process involved. "I was walking to the bus stop one day" he explains, "and saw an LSBU poster encouraging prospective students to seek advice. When I looked into it I had incomplete entry qualifications because I didn't finish my BTEC course. Instead, I applied with qualifications from short courses and previous relevant work experience but that was enough for the degree course so I applied through Clearing for LSBU's foundation course instead." Aside from the support the University offered him, Daniel was also drawn to LSBU for its unrivalled location in the heart of the city. Clearing gave Daniel his opportunity to go to university. To finally graduate with his degree, Daniel completed a full-time foundation degree over two years and followed this with a further two years on our full degree to gain his BSc Sport and Exercise Science. Daniel's passion and accomplishment in Taekwondo, which he has been studying since the age of four, allowed him to receive a full Sports Scholarship from the University. Offered by our Academy of Sport, the scholarship is designed to support talented athletes balance their sport, academic and personal lives. "I chose this course because the subject has always been a major interest. I've always excelled in sports and science. I love the science behind what makes athletes exceed physical limitations." Daniel was highly involved in student life during his time at LSBU, serving as both a Student Ambassador and Sports Ambassador. He was also awarded certificates in recognition of his sporting achievements and won a silver medal in the 2011 Commonwealth Championships, which he describes as the pinnacle of his competitive career so far. "One of the best things about studying at LSBU was the support from its many dedicated academics. The course was really challenging but the lecturers were always willing to offer extra support to students who put in the work. Jumping from the foundation course to the full degree was a big step and some of the subject areas were out of my depth but the extra support from my lecturers allowed me to reach my potential." 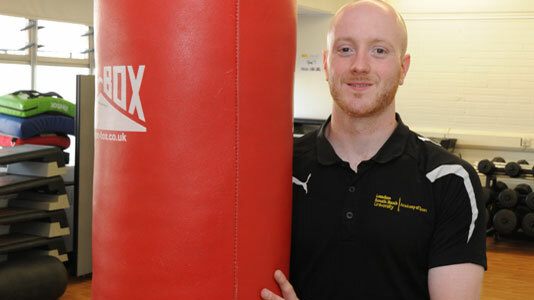 Daniel currently works as a duty officer and personal trainer at LSBU's newly refurbishment Sports Centre, as well as coaching the University's Taekwondo team and supporting the Sports Scholarship team in decision making for Taekwondo applicants.